For those filling out brackets, you have until noon on Thursday to finalise your picks. Below we break down a few options for those struggling to fill out their brackets this year, from backing former champions to mascot fights. March Madnessbrackets are due on Thursday, March 15. Building the perfect bracket is all but impossible – you have a 1 in 9,223,372,036,854,775,808 chance of doing it this year – but that’s no reason not to try. Just like any team in the field of 68 can string together a few perfect games to become the national champion, any person can put together a bracket and get lucky enough to win their pool. If you’re not a die-hard basketball fan or are almost fully unfamiliar with the sport this year, the prospect of filling out a bracket can be a bit daunting, but it shouldn’t be! Anything can happen in the NCAA Tournament, and even the best of experts are only guessing when they suggest their locks for the Sweet 16 and potential upset picks. Whether you choose to play it safe and pick mostly favourites or go wild imagining mascot fights, here are a few suggestions for making the process of building your bracket a bit easier. 1. Play it safe and pick the favourites. If you haven’t been keeping up with the college basketball year, or are unaware of the sport in general and just like being involved in your office bracket pool, there’s nothing wrong with backing the favourites and playing things safe. While I wouldn’t recommend sending four No. 1 seeds all to the Final Four (it’s only happened once), if you pick a mix on Nos. 1, 2, and 3 seeds to make it to the end, and then back Duke as your eventual champion, you’ll probably make it through the first weekend of the tournament without your bracket getting busted. It’s not the most exhilarating way to go about filling your bracket, but spice up your first few rounds with a couple of upsets, and you’ll at least have a rooting interest as March Madness takes over every bar television in America for the next three weeks. Rather than picking just the favourites from this year’s bracket, casual bracket builders can also use historical tournament pedigree as a tool to fill out their entry. This year, there are plenty of lower seeded teams that have proven themselves in the past to be tournament powerhouses. No. 6 Villanova has won two of the past three national championships, and Tom Izzo led No. 2 Michigan State to the Final Four a whopping seven times since 1999. Perennial tournament contenders Kentucky and Michigan also find themselves without a top seed in their regions this year. If you want to avoid going full chalk with your bracket but still back teams you can trust in the postseason, you could do much worse than picking your favourites among those who have done it before. 3. Pick your favourite stat and follow it to the ends of bracket possibility. Now we start sliding into the weirder ways of filling out your bracket. When going through team by team, why not select which stats you believe are important in building a championship contender, and work from there? 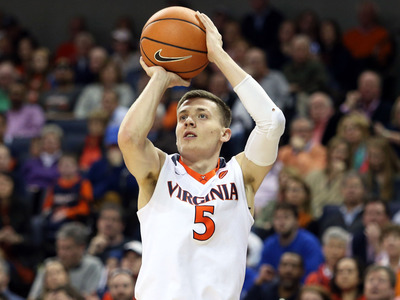 Are you a fan of three-point shooting? Virginia is a No. 1 seed and is one of just two teams in the tournament field shooting more than 40% from beyond the arc. Do you believe that defence wins championships? No. 2 Michigan and No. 3 Texas Tech both have held opponents to less than 59 points per game. With just a few minutes of data input on a spreadsheet, you can even combine stats you believe to be valuable to create a new statistic all your own. You don’t have to follow your statistical choices as law – I would advise on picking a top seed to beat their No. 16 opponent, even if you’re accounting for foul shots and the lesser team has been perfect from the free throw line. But picking a stat you believe in and sticking to it is a great way to make the tough choices towards the end of your bracket, and a fun indicator of potential upset picks you might like to back in the early rounds. 4. Follow an expert or celebrity bracket. If you want to be extra passive while filling out your bracket, there’s no shame in following the lead of a celebrity or analyst you trust. While the tradition of the presidential bracket has fallen off since the Trump administration took office, there are still plenty of expert and non-expert brackets out there to use as a launchpad for yours. Pick a trusted writer at ESPN or any number of other sites (hint: Business Insider), and use their picks as a way to get you into the game. 5. Base your picks on colours, fight song, and/or personal grudges. It’s always fun to get a bit of school pride involved. In this case, basing your picks off of school colours, fight songs, and any particular grudges you have against different schools across the country is usually an interesting experiment in breaking up people’s overly-cautious tendencies with bracket building. 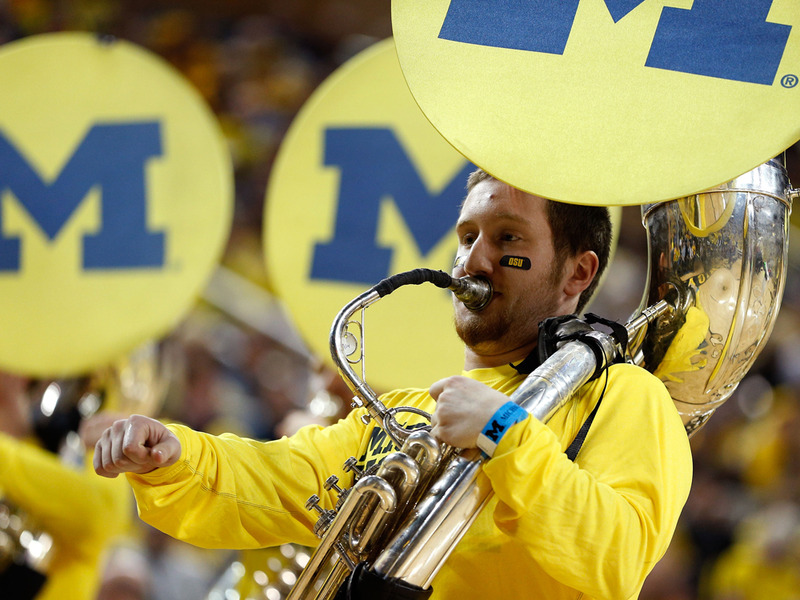 Picking by fight song usually isn’t that bad of a bet, as great basketball teams and great bands go relatively hand in hand. Additionally, school colours can add a bit of variance to your bracket, or at the very least help you sneak UNC and Tennessee into your Final Four. 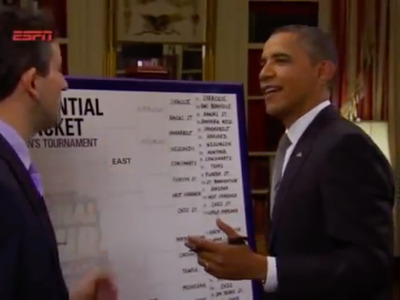 But in my opinion, there is no better way to fill out your bracket than based on petty grievance. Did a former friend of yours go to Villanova and turn into a dudebro that raves about IPAs and his stock portfolio and is now impossible to have a conversation with? Knock ’em out in the second round. Still holding a grudge against Christian Laettner? Take out Duke early and laugh when they fall. Have a crush on someone that graduated from Michigan State? Pick them to make a run to the Final Four and use it as a way to start an awkward text conversation that you’ll probably later regret. It’s your bracket and it’s your right to use it to exorcise whatever emotions you might need to let out. 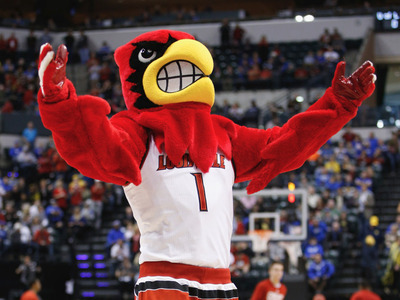 Even if you don’t use it as a way to build your bracket, at the very least, go through the process of mentally imagining a few mascot fights, just for the thrill of it. It’s one of the weirder ideas that gets thrown around every March, but that makes it no less fun as a thought experiment. Badgers vs. Ducks! in the first round! Spartans facing off against Blue Devils in the Elite Eight! Bulldogs fighting Wildcats for the national championship! Let your imagination run wild with the possibility of it all. Personally, I think Purdue would dominate the field operating by this logic, as trains are notoriously difficult to stop, but you’re welcome to your own interpretation. 7. When in doubt, in KenPom we trust. There are plenty of fun ways to build and break your bracket. But if you’re ever in a tough spot that you don’t know how to get past and refuse to leave up to a coin flip or some other form of chance, consult with KenPom. 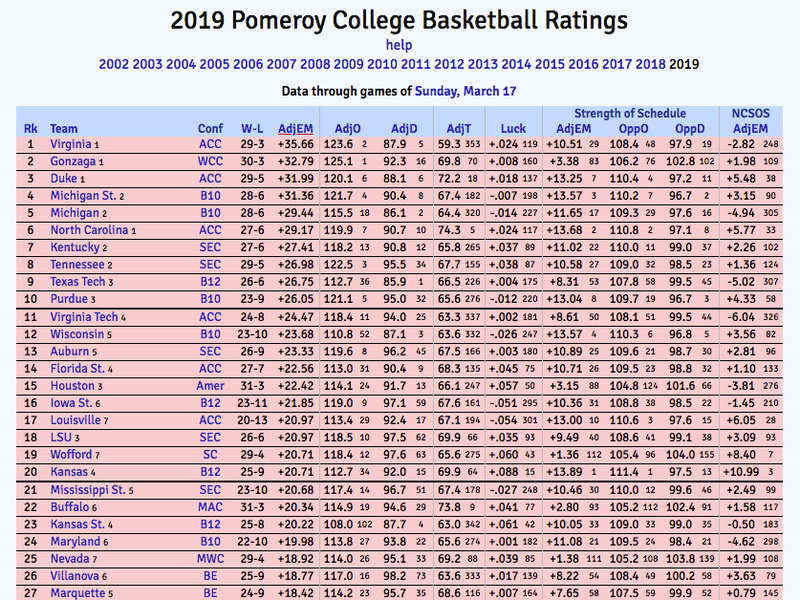 Ken Pomeroy is a savant of college basketball statistics, and his ratings are some of the best and clearest indicators of potential success you can find. 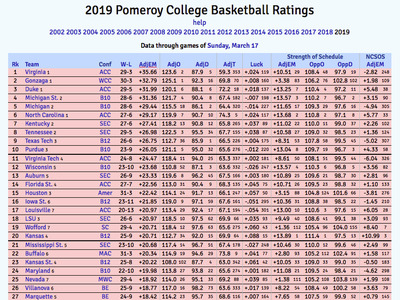 Whether you’re stuck on a difficult first-round match, or have your perfect Final Four but don’t know who to pick to win it all, you can do far worse than simply following KenPom’s advice.